With the cold weather this time of year, I am craving warm and satisfying meals. If you know me, I am such a sweet tooth. My days are usually filled with fruit and acai bowls. However, this snowy and cloudy weather has me freezing. I am trying to warm my insides with hot tea and home-cooked meals. 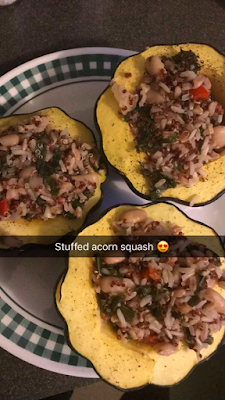 I have been seeing acorn squash recipes for a while now on Pinterest and have been dying to try one for myself. Since acorn squash is in season, I decided this would be the perfect time to create a nice healthy recipe with it! It is nutritious, filling, and very tasty. I cooked this for myself, my brother, and my mom and we all thought it was delicious. Feel free to change up this recipe to satisfy your own taste buds. You can add in veggies such as green beans or chopped carrots, or change the quinoa to wild rice. Taste as you go to see if you want more spices, go crazy! This recipe does takes a while to cook, but it is not difficult at all. Since the dish looks very fancy, it is great to throw together for a nice family dinner. It will make you look and feel like an impressive chef! Preheat oven to 350 degrees Fahrenheit. Slice the two acorn squashes in half and scoop out the seeds. Brush the olive oil evenly on the yellow part of the acorn squashes and lightly sprinkle on salt and pepper. Fill a baking pan with ½ inch of water. Place the acorn squashes cut-side-up in the baking dish. Place in the oven for about one hour. While the squash is in the oven, sauté the diced onion, red pepper, and garlic in a pot with just enough water so they do not burn. Once the onions are golden and garlic is fragrant (about five minutes), add in the cup of vegetable broth and half cup of quinoa. Bring to a boil. Once boiling, reduce heat to a simmer and cover for approximately 30 mins. Once quinoa is cooked thoroughly, add in the kale and can of beans. Stir in 2 tsp of garlic powder, 2 tsp cumin, and salt and pepper to taste. Remove from heat. Take the acorn squash out of the oven and spoon the quinoa mixture evenly into the acorn squash halves. Garnish with chopped onion and dried cranberries if desired. Depending on how hungry you are and how large your acorn squash is, this can serve 2-4 people. This recipe tastes best when fresh out of the oven, but you can refrigerate the leftovers for a few days. Enjoy! This looks like an incredible recipe! I love acorn squash. I haven't had it in a while though, so I think I might try out your recipe this week! What a simple and healthy recipes to keep you warm during the lasting winter months. Where can you find Acorn squash? Can that be found at a grocery chain or is it something you'll have to order in a speciality shop. Thank you, Love! I hope you enjoy it! Oh my! This looks really delicious. The recipes look easy to make and the dish is perfect for winter! Thanks for sharing this! Adding your blog to my GoTo Vegan/Vegetarian recipe folder! Thanks!